The term “kata” is found in classical martial arts as well as performing arts (geidō 芸道) of Japan. The conception is not different. In the world of arts, crafts, and craftsmanship there has been a huge controversy about which character is correct for writing “kata”. In Okinawa karate, the same argument was addressed between Nakazato Jōen and Nagamine Shōshin. Due to the limited space here I will skip the important question as regards the character itself and instead attempt to outline the conception of kata as neutral as possible. Kata are inventions once created by a master in a specific field of study. They are associated with a practical quality, an aesthetic quality, a normative quality, and a conjunctive quality. Such kata originally existed in various individual techniques, each endowed with a unique meaning. These techniques were then assembled and unified into a standardized, methodical “architecture”. By the fact that a large number of people based their acts, conducts, behaviors etc. upon this methodical “architecture”, such a kata achieved a quasi-official recognition as something being of a distinguished quality. Nanpōroku with its various scrolls. Sen’ami 宣阿弥, who noted on a book with secret traditions about the Rikka (tatebana) 立花 style of Ikebana by Mon’ami 文阿弥 (? – 1517) which emphasizes the central axis. Hōjutsu Hidensho 砲術秘伝書 by Inadome Ichimu 稲富一夢 (1522 – 1611), in which methods such as shooting and aiming at targets are shown in detail. Moreover, in manuscripts of secret traditions from various ryū (schools) of kenjutsu in various regions often only kata are found described. From the above can be seen that the concept of kata transports a law-like and normative character. Kata are about standardized methods restricted by tradition. You don’t just arbitrarily change it. Such a kata is performing a skill that has been taught by example. Furthermore kata have been developed and performed by past geniuses or masters as the highest authorities in their respective field of expertise. That is, the kata is a specific skillset that was recognized by the majority of people as an outstanding achievement and the most prestigious of its kind. Therefore, referring to what was taught by the master, kata possess a quasi-legislative and normative character. Kata is therefore something that is restricted, restrained, tied to and linked, and confined to exactly those teachings. In the world of practical skills this point is solemnly agreed upon. Conversely speaking, unless kata is a model, a standard, a pattern, or a norm tied to and linked to the teaching of the creator and his lineage of tradition, it does not qualify of being a kata in sense of an art form. It would be a simple mechanical craft, or a mere sequence of movements. Originally performed as cultural traditions among a few aristocrats in ancient and medieval times, in early modern times various skills became exposed to an enormous number of passersby who began to launch into each of the performing arts. By this development the value and prestige of kata thoroughly increased: the concept of kata achieved authority that was universally recognized and possessed a normative character that was close to absolute. Created by masterful individuals, the kata 型 and distinguished skills they transport became objectified and therefore became independent from their creators. However, due to the high authority of the kata and with its absolutized normative character, the creators of the kata were held in the highest regards by those enthusiasts who followed the respective performing art. The hereditary houses or lineages which handed down such traditions are still highly respected today. Such in case of the important tea master Sen no Rikyū (利休, 1522 – 1591), or the brilliant haiku poet Matsuo Bashō (芭蕉, 1644 – 1694). Likewise, specialists in the art of war also discovered underlying principles, devised idiosyncratic techniques, developed uniform teaching methods and handed them down in the form of kata. 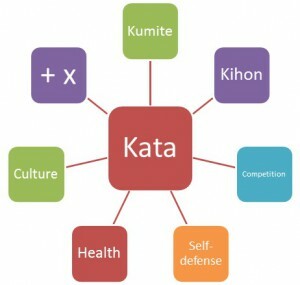 According to various dictionary entries and in accordance with the above, kata are techniques and forms of expression which posses distinctive properties and a special quality and which were created by masters or other outstanding authorities in a specific field of practical skill. Formulated a bit differently, a kata is a form or formality that has been determined by customs, cultural practices, or tradition. It is a custom, a precedent, a convention. Or in yet other words, kata are standardized postures and actions considered a norm, a specific method, a style, a standard, such as in the budō, the traditional performing arts, in sports and the like. Such kata have to be considered one major factor in the origin of the various complex schools or ryūha, by means of which the arts were taught. In their lexical meaning, the terms kata and ryūha overlap in that they are defined as traditional artistic skills, special techniques, or the craft of a family or a lineage of tradition which employs teaching methods such as secret traditions (hiden 秘伝), instruction by word of mouth (kuden 口伝) and the like. In case of techniques for actual combat, military commanders like Kamiizumi Ise-no-Kami (ca. 1508 – 1577) and Yagyū Munetoshi (1529 – 1606) from the Shinkage-ryū tradition were at the forefront of those who created and handed down prototypical ryūha. Ryū 流: Techniques (methods, style, a system, patterns, or formulas) in budō, the performing arts (geidō), arts, crafts, handicrafts and the like which are unique to a specific family, to a person, or to a lineage. In addition, it refers to the lineage of this method, its ancestry or line of descent. Ha 派: 1) a group of people that follows the same doctrines, opinions, methods. 2) When used as a suffix it indicates that it belongs to a certain stream or trend, such as in arts, technology, scholarship, religion and the like. Ryūha 流派: Name that combines ryū 流 and ha 派. In general, ryū is the higher classification, and ha is a subclass. BTW, according to the above, a subclass (ha) cannot re-define its own superordinate class (ryū), nor its contents (kata), without signifying that such changes were made. It is said that karate is a bujutsu whose existence is fully determined by kata. Seen from the perspective of offense and defense, direction, fast and slow, hard and soft etc., the characteristics of kata in karate differ immensely from those in jūdō and kendō and other budō. In the Japanese traditional martial arts such as jūdō and kendō, the kata provide both the external form as well as the content of an already defined technique. In other words, the practical skills are already defined in such a way that they clearly demonstrate the relationship between external form (kata) and technique (waza). Consequently, it can be said that kata here is tantamount with the technique (waza) itself. 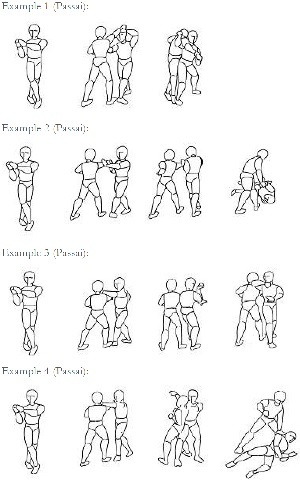 Moreover, descriptive names are used for individual techniques as well as for complete kata and describe their technical content, such as in the case of seoi-nage (shouldering throw) etc., or nage-no-kata (forms of throws). Examples from Passai as adapted by Shinzato Katsuhiko. In karate, kata only provides the external form of the technique, but not the content. In other words, the practical skills are not defined and the kata do not clearly demonstrate the relationship between external form (kata) and technique (waza). Furthermore, the names of the kata in karate are ambiguous. For example, Sūpārinpē, the highest kata of Gōjū-ryū, according to a folkloristic view includes 108 kinds of techniques. But besides personal interpretations by seasoned masters these 108 gestures are not specified or fixed. Moreover, and contrary to jūdō and kendō, the names of the kata of karate such as Naihanchi, Passai, and Kūsankū etc. barely allow any conclusion about its technical contents, nor do the names of individual techniques contained therein. It is even impossible to categorize a gesture found in the kata as solely belonging to the categories of offenses or defenses. Karate in all its parameters is a function of kata. The kata of karate are the theorization of principles and carry a plurality of skills with their meanings hidden behind a high level of abstraction. Each move or gesture within a kata of karate can easily be interpreted as a multitude of applied techniques. And this is the very raison d’être of karate kata as well as their main difference to the kata of jūdō, kendō etc. This is the reason why it is said that karate is a bujutsu whose existence is fully determined by kata. And it is also the reason why it is said that “Karate begins with kata and ends with kata.” By assigning fixed techniques to the gestures of kata, karate will be misconceived for something else and in consequence loses its very raison d’être. The same is true for changing the kata for specific purposes, for example a specific application, or for competitions. Kihon and kumite (yakusoku, bunkai, oyo etc.) are not individual entities. Instead they are simply inherent elements of the open architecture conception of kata. Karate is not made up of “three k”, but karate in all its parameters is a function of kata. Cf. Ryūkyū Shinpō, November 8 and 25, 1995. Southern Record. Purported book of secrets describing the teachings of the tea master Sen no Rikyū 千利休 (1522 – 1591). Know as Inadome Sukenao 稲富祐直. Inadome-ryū Hōjutsu Hidensho 稲富流砲術秘伝書. Matsunosuke Nishiyama: Kinsei Geidō no Shisō no Tokushitsu to sono Tenkai 近世芸道の思想の特質とその展開 (Evolution and characteristics of the Concepts of the Performing Arts in Early Modern Times). In: Matsunosuke Nishiyama, Watanabe Ichirō, Gunji Masakatsu: Kinsei Geidōron. Iwanami Shoten, Tōkyō 1972. 西山松之助, 渡辺一郎, 郡司正勝: 近世藝道論 . 岩波書店, Tōkyō 1972. Uozumi 2013: 6. Takamiyagi Shigeru, in: OKKJ 2008: 209–10. With references to: Matsunosuke Nishiyama: Kinsei Geidō no Shisō no Tokushitsu to sono Tenkai 近世芸道の思想の特質とその展開 (Evolution and characteristics of the Concepts of the Performing Arts in Early Modern Times). In: Matsunosuke Nishiyama; Watanabe Ichirō; Gunji Masakatsu: Kinsei Geidōron. Iwanami Shoten, Tōkyō 1972. 西山松之助, 渡辺一郎, 郡司正勝: 近世藝道論 . 岩波書店, Tōkyō 1972. Takamiyagi Shigeru, Shinzato Katsuhiko in: OKKJ 2008: 209–22. Shinzato 1996: 268–93. This entry was posted in Unknown Ryukyu. Bookmark the permalink.